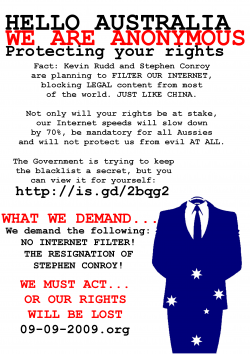 Anonymous' flyer against the government's Net censorship. Threats from protest group Anonymous to disable the Web site of the Australian Prime Minister appear to have rung true. A spokesperson from the Australian Computer Emergency Response team confirmed that the pm.gov.au had come under a distributed denial of service (DDos) attack last night and was disabled as a result, however no intrusion into the site was detected. A spokesperson from the Australian Federal Police said that as of 11am this morning, the matter had not been referred to the agency for investigation, but was instead being managed by the Attorney General’s office. A spokeswoman from the Attorney Generals' office also confirmed the Prime Minister’s website was unavailable for a short time shortly after 7pm on 9 September 2009 due to a distributed denial of service (DDoS) designed only to disrupt access to the website, conducted by a group calling itself ‘Anonymous’. There was no unauthorised access to the website’s infrastructure and visitors to the site received an error message stating that the service was unavailable. The spokeswoman said relevant Australian Government agencies worked with Internet service providers to ensure that the site was restored. "The Cyber Security Operations Centre (in the Defence Signals Directorate) is providing IT security advisers (ITSAs) in each of the targetted Australian Government agencies with assistance to monitor and respond to the threat," the spokeswoman said. "Agencies are working with their Internet service providers (ISPs) to respond to any attacks." Commenting on the relatively quick return to service of the pm.gov.au site, she said that Australian Government agencies identified as potential targets by ‘Anonymous’ were briefed in advance and were provided with suggested mitigation strategies. "Media reports that other Australian Government websites, including that of the Australian Communications and Media Authority, were affected are inaccurate," she said. The disabling follows a ‘Declaration of War’ against the Australian government by Anonymous as a reprisal for its role in establishing an Internet filter. On the site, the group urged members to initiate denial of service attacks on the Web sites of the offices of Department of Broadband, Communications & the Digital Economy, Communications minister Stephen Conroy, and ACMA. It also called for the mass spam calling and facing of the offices of the same. “1. We need to blast their servers into the dust. We already have about 60 lazors, and as such this should run smoothly. Ausfags are reminded that they will be more useful /efg/'ing and blackfaxing etc.” the group wrote. “2. All Australians must either /efg/, blackfax or call in constantly... Targets for blackfax are below. Find and call the numbers for the DBCDE and tie them up. Print out fliers and cards and distribute them in public areas. Hit them hard, boys. Use white-on-black messages such as Information Is Free, the links, NO CENSORSHIP etc.” . The groups’ “Formal Declaration of War” argues that the Australian government is “guilty of planning to force censorship of the internet and make it mandatory to their online users”. “Whereas, such acts continue to pose extreme threat to the security and freedom of the internet and its users; and such acts render it both necessary and appropriate that Anonymous exercises its rights and acts in defense of themselves and the supporters of net neutrality,” the site reads.